Fayemi’s team says Fayose has allegedly hired thugs to pose as the minister’s supporters and attack followers of Segun Oni. 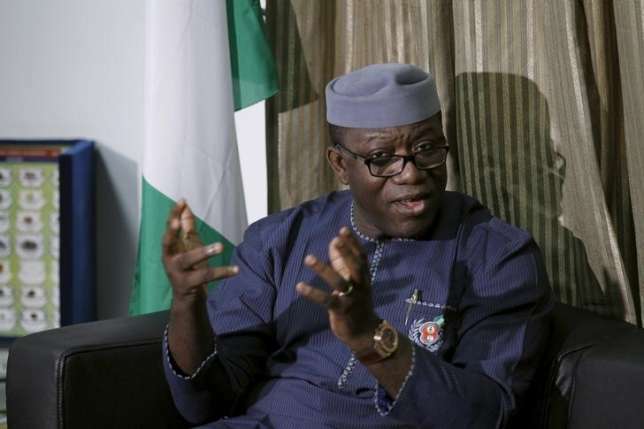 The campaign team of the Minister of Solid Minerals Development, Dr. Kayode Fayemi has accused the Ekiti State Governor, Ayo Fayose of planning to cause chaos in the party. Fayemi recently emerged as the flag bearer of the All Progressives Congress (APC) ahead of the governorship election slated in the state. According to Daily Post, Fayemi’s team says Fayose has allegedly hired thugs to pose as the minister’s supporters and attack followers of Segun Oni. Speaking further, a representative of the campaign team, Yinka Oyebode said the plan is to cause dis-affection between Fayemi and Oni. Oyebode also called on APC members in the state not to take laws into their hands in case of any provocation. Oyebode also urged security operatives to investigate the allegations. “According to information, the assailants would carry out the dastardly act, wearing JKF branded materials and making insinuations that would establish a possible link to the Fayemi political camp. “Security agencies in the state are hereby alerted to this clandestine move by the PDP goons aimed at introducing violent dimension to the politics of the state ahead of the July 14 governorship election. “We urge all supporters and members of APC to remain vigilant, shun any form of violence during this electioneering period and report any act of intimidation to the law enforcement agencies. “The Campaign office reiterates the position of the APC leadership that all members of the party should unite and work together for the success of the APC in the coming elections," he added. Governor Fayose recently told President Buhari that the All Progressives Congress (APC) will be disgraced during the upcoming governorship election in Ekiti state. He also said that that the Peoples Democratic Party (PDP) candidate, Kolapo Olusola, will win the election. According to the Independent National Electoral Commission (INEC), the Ekiti state governorship election will hold on July 14, 2018.